You are here: Home / Money / Business / Why Federal Employees Are Suffering. 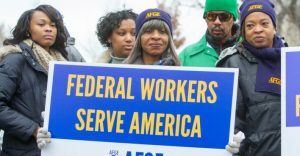 Why Federal Employees Are Suffering. (ThyBlackMan.com) A long time ago my father worked for the post office – one of the ideal jobs that African Americans acquired and stayed with near the end of the civil rights movement of the 60s. My dad missed 3 days of work total in a 32 year period. And yet when he retired, they gave him punch and cookies in the break room, a plaque with his name spelled wrong and barely enough to live on the rest of his life. I never ever forgot his experience and I learned from it. What did I learn? Apparently lessons that federal employees are now having to learn the hard way amidst the Trump shutdown. I learned 4 things and built my financial plan accordingly. First that I could neither trust the government nor any other employer to always take care of me and my family. That responsibility belonged to me and my wife. Second that I needed a backup plan. Third that it was never wise to become over committed, deep in debt and live above my means. And fourth that saving for a rainy day was absolutely necessary because that day would likely come. There are 5 simple reasons that federal employees (and contractors) are suffering during the Trump shutdown. And yes many of these reasons are the fault of the federal employees, though the truth may hurt. You can only be thrown off track if you let someone throw you off track. That being said, here are the 5 reasons that federal employees and others are suffering during the TRUMP shutdown. Little boy Donald Trump playing politics in order to have his way. Unexpected BS! Federal employees trusting in the government instead of themselves. Failure to have a plan B – other than your primary job. Failure to save for a rainy day. Living above your means and in debt so there is no money to save for a rainy day. You should never ever put more trust in any employer than you do yourself. When that happens, they control far too much of your livelihood. That is exactly what happened when millions of people committed themselves to trusting in the SNAP food stamp program, welfare, WIC, Section 8, Medicare or Medicaid. YOUR EMPLOYER IS NOT RESPONSIBLE FOR YOU, YOUR FAMILY, YOUR FINANCES AND YOUR LIVELIHOOD – YOU ARE!!! If you don’t learn this, you could end up in a soup kitchen line. Yes in a democracy the government was supposed to be of the people, by the people and for the people but that is an illusion of wishful thinking which does not exist. We live in a stated democratic republic. But we really live in a capitalist, sink or swim, class system, corporate have and have nots run society. A society where lobbyists for corporations and special interest groups are allowed to legally bribe political officials and control the decisions of politicians on both sides of the aisle. So this Trump shutdown should be a wake-up call. Those who do not learn from history are clearly doomed to repeat it and if you keep taking the same approach that allowed you to get in a jam but expect a different result, yes you are “insane”. Yet nobody in the media seems to be addressing anything I have said in this article other than Trump, Pelosi and blaming the government. I am not exonerating Donald Trump one bit. But You are responsible for your finances, yourself and your family – not Donald Trump, not Nancy Pelosi, not the Democratic Party, not the Republican party, not Senators, not congress, not Wal-Mart, Apple, Coke, McDonalds, the hospital nor where ever else you are employed. There is one good thing about Donald Trump being president. He is so blunt, so unempathetic and so blatant that he wakes people up to reality. The reality that the government does not care about taking care of you – citizen or not. That the politicians we elected have other agendas and marching orders from elsewhere – not us. That racism and class-ism are alive and well. That capitalism and political games run this country. That you cannot transfer your responsibility for yourself and your family to any company or government ever. If you are a federal employee, were you really trusting Trump, Obama, Clinton, Bush or the federal government anyway? Why? Why would you yield that much control to an employer who realistically could care less about the prosperity of your family. If you are trusting the federal, state, county or city government to take care of you, provide housing, food for your children, money for your car note or mortgage, you are giving away both power and authority. Sometimes the best lessons have to hit us like a rock for us to pay attention, get the point and remember them. So therein is a lesson for all of us. Don’t make the same mistake twice.